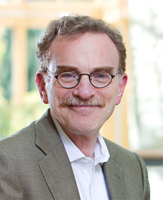 Dr Randy W Schekman is a Professor in the Department of Molecular and Cell Biology, University of California, Berkeley, and an Investigator of the Howard Hughes Medical Institute. When he joined the faculty at Berkeley, he developed a genetic and biochemical approach to the study of eukaryotic membrane traffic, which reveals how proteins enter and move between membrane-bound compartments of cells. Among the honours he has earned are the Gairdner International Award, the Albert Lasker Award in Basic Medical Research in 2002, and the Nobel Prize in Physiology or Medicine in 2013 – which he shared with James Rothman of Yale University and Thomas Südhof of Stanford University – for their discoveries of the mechanism regulating vesicle traffic, a major cellular transport system. In 2011, he was appointed Editor-in-Chief of the open access journal, "eLife", sponsored by the HHMI, The Wellcome Trust/UK and the Max Planck Society.